Matik is responsive Wordpress Woocommerce theme with unlimited layout options and a lot of unbelievable features. 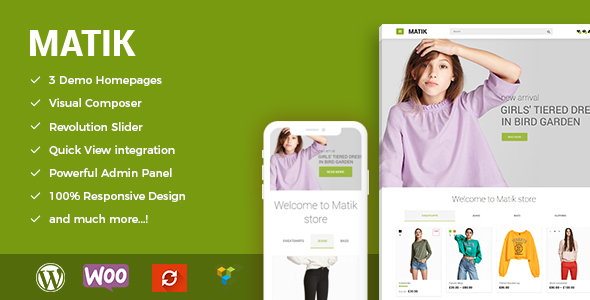 Itâ€™s suitable for any store such as: fashion, retail, furniture, Jewerly, accessories, beauty, cosmetic, flowers, kids toy or any store Not just support WooCommerce, Matik comes with exclusive designs integration. This allows you to create a professional eCommerce website in a snap. Matik comes with many products shop styles and more in the future. Check the demos to see by yourself.